Proud to make yet another performance-enhancing accessory, Newer Technology pulls off a new plug and play device simply called the NewerTech eSATA to USB 3.0 adapter. It’s a device that’s nothing short of unique in that it can fill the void for speed left by slower adapters. The NewerTech USB 3.0 adapter can handle 206.4MB/sec writes and 247MB/sec reads that calculate to a data rate performance six times faster than USB 2.0. The device was highlighted during the annual Macintosh Conference held in Moscone Center in San Francisco. The External Serial Advanced Technology Attachment or eSATA is an external interface for SATA technologies that usually competes with FireWire 400 and USB 2.0 in providing fast data transfer for external storage devices. The idea behind the USB 3.0 adapter is to be enable the user to take their 2.5-inch or 3.5-inch eSATA hard drive and translate it for USB 3.0 use and enjoy speedy data transfer of up to 5Gb/s. eSATA should actually be thankful for this new accessory considering it keeps the interface relevant and usable in an increasingly SuperSpeed-oriented world. The adapter is compatible with HDDs and SSDs of Macs with Mac OS X 10.2.8, and PCs with Windows 2000 and later. On top of that, USB 3.0’s backward compatibility enables support of USB 2.0 products! The NewerTech USB 3.0 adapter has beaten the fastest commonly found interface in Mac computers, FireWire 800, which reads 81.8MB/s and writes 78.6MB/s, and the much slower USB 2.0 interface on PCs that reads at 38.4MB/s and writes at 32.2MB/s. To use the adapter is as easy and simple and it looks. Just power on your eSATA equipped external drive then connect the USB converter to the drive via a standard eSATA cable. Then, connect the NewerTech Adapter to the USB 3.0 port on your computer via included USB 3.0 cable (or your USB 2.0) and it should work perfectly. The USB 3.0 adapter is backed by a yearlong warranty from NewerTech and is now available at OWC and other retail stores for an affordable $29.95. 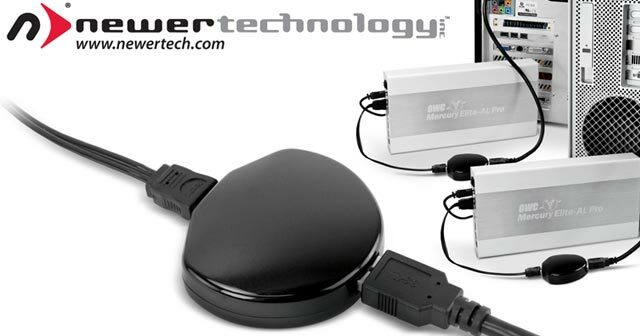 Could you see yourself using a NewerTech eSATA to USB 3.0 adapter? Feel free to comment below! This entry was posted in Articles, Newer Technology, SuperSpeed USB 3.0, USB 3.0, USB 3.0 Adapter, USB Devices, USB Gadgets and tagged eSATA, eSATA hard drive, External Serial Advanced Technology Attachment, Newer Technology, NewerTech Adapter, NewerTech eSATA to USB 3.0 adapter, NewerTech USB 3.0 adapter, SATA technologies, USB 3.0 adapter. Bookmark the permalink.